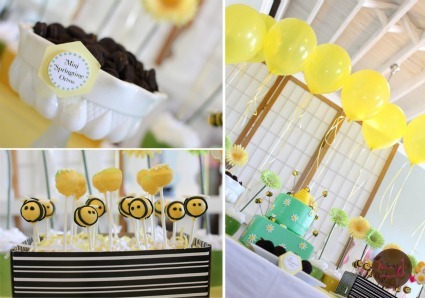 This page is absolutely buzzing with exciting and colorful "Bumble Bee Baby Shower Ideas!" You'll fall in love with the unique ideas and creativity involved in this party! 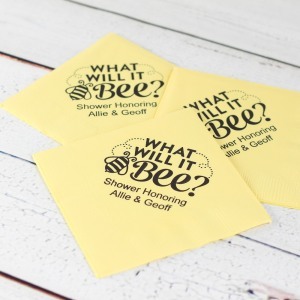 It was originally designed for a child's party, but would also make a perfect Bee Baby Shower! This creative event was designed by the talented party stylist, Alexandra of Enchanted Events & Design. The beautiful pictures were taken by Mia J Photography. 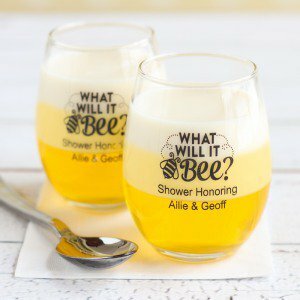 "Sweet As Can Bee" Honey Jar Favors - can be personalized with your baby shower information and given to each guest as a way of thanking them for coming. You can find these cuties here. 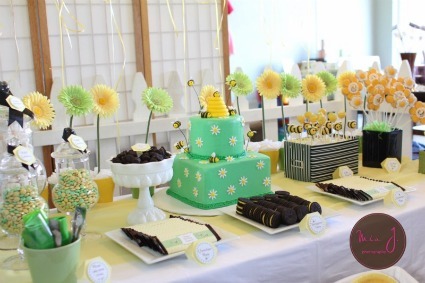 The color scheme used for this Bee Baby Shower is so bright and cheerful! 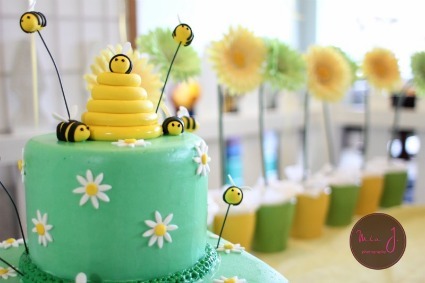 My favorite part of the party was the cute cake - the bees are adorable and I love the hive on top. Every little detail was so well thought out and it all comes together perfectly! 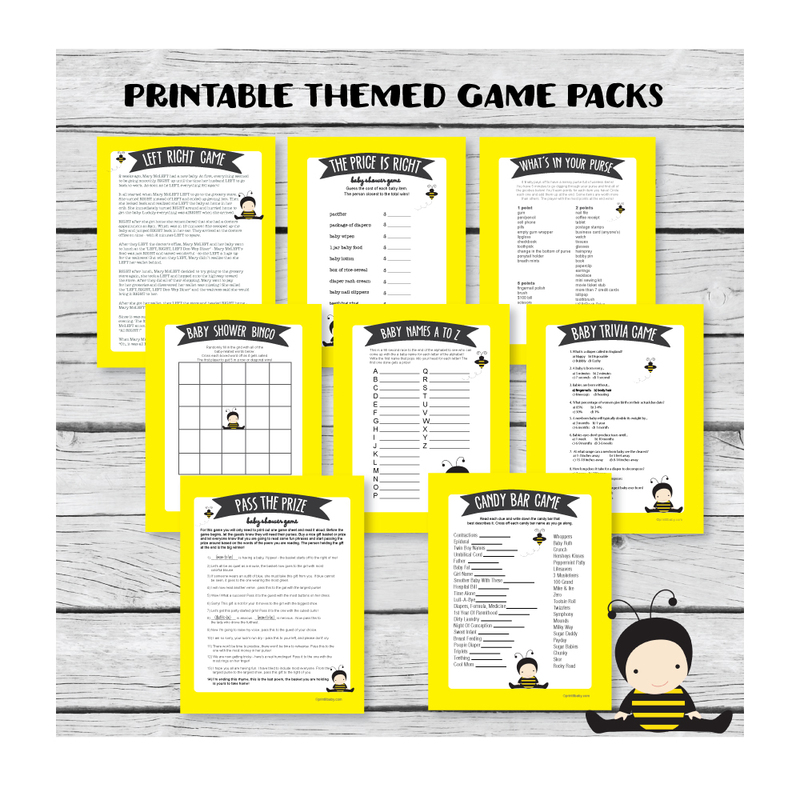 The print-from-home Bumble Bee Game Pack & Theme Pack were designed to make your planning a bit easier! Buzz over to our sister site (PrintItBaby.com) to take a peek. 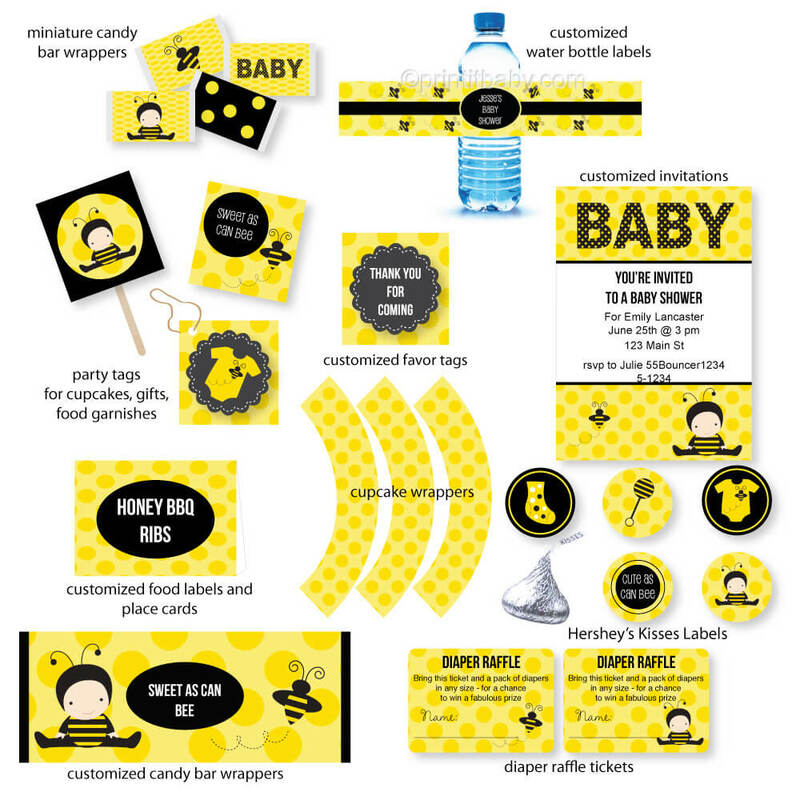 In addition to games, you will find bee-themed invitations, water bottle labels, favor tags, & candy bar wrappers! See the entire bee collection here. Below is a how-to video for making the cute fondant bumble bees: Once you make these little guys, you can poke them into a block of floral foam that has been covered in cute paper or shredded paper as in the photo above. Have a big glass bowl full of Honey Comb Cereal for guests to enjoy. For a baby shower favor or prize idea you could hand out black and yellow nail polish packaged in a cute little bag - with a little nail file tucked inside. 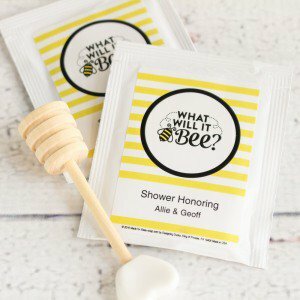 Make a sign to welcome guests as they arrive saying: "Welcome to the Ba-Bee Shower!" or "Cute as Can Bee"
The possibilities are endless when it comes to being creative with this cute theme! 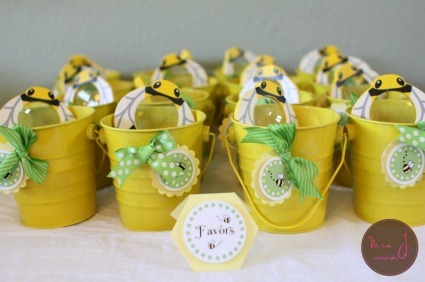 you can grab all of these cute bumble bee ideas - here.